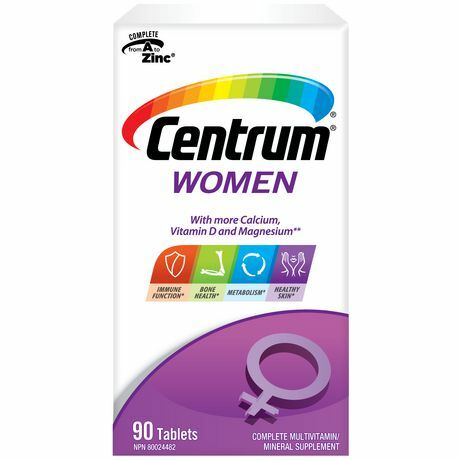 Centrum Women is a complete multivitamin formulated with essential vitamins and minerals including Calcium, Vitamin D and Magnesium to help address nutritional gaps of women. Vitamin and mineral supplement. Always read and follow the label. Vitamin A (vitamin A acetate) 300 mcg/1000 IUBeta-Carotene 600 mcg/1000 IUVitamin E (dl-a tocopheryl acetate) 12.6 mg/28 IUVitamin C (ascorbic acid) 150 mgFolate (folic acid) 0.4 mgVitamin B1 (thiamine mononitrate) 3.85 mgVitamin B2 (riboflavin) 3.85 mgNiacinamide 14 mgVitamin B6 (pyridoxine hydrochloride) 5 mgVitamin B12 (cyanocobalamin) 21.6 mcgVitamin D (cholecalciferol) 20 mcg/800 IUBiotin 45 mcgPantothenic Acid (calcium d-pantothenate) 11 mgVitamin K1 20 mcgCalcium (calcium carbonate and phosphate) 400 mgIodine (potassium iodide) 0.15 mgIron (ferrous fumarate) 7.5 mgMagnesium (magnesium oxide) 64 mgCopper (cupric sulfate) 0.9 mgManganese (manganese sulfate) 5 mgChromium (chromium chloride) 25 mcgSelenium (sodium selenate) 55 mcgZinc (zinc oxide) 8 mgLutein (marigold flower tagetes erecta) 1000 mcgLycopene 600 mcg Non-Medicinal Ingredients: Acacia, BHT, citric acid, corn starch, crospovidone, FD&C Blue No. 2 Aluminum Lake, FD&C Red No. 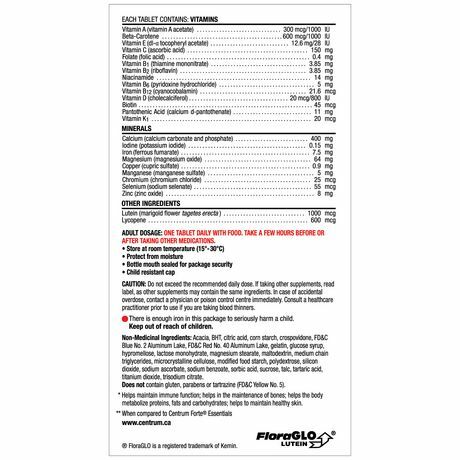 40 Aluminum Lake, gelatin, glucose syrup, hypromellose, lactose monohydrate, magnesium stearate, maltodextrin, medium chain triglycerides, microcrystalline cellulose, modified food starch, polydextrose, silicon dioxide, sodium ascorbate, sodium benzoate, sorbic acid, sucrose, talc, tartaric acid, titanium dioxide, trisodium citrate. 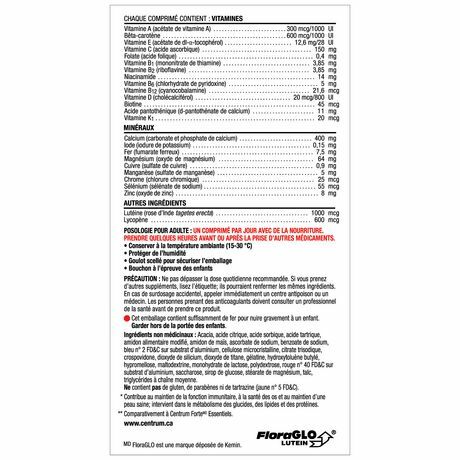 Does not contain gluten, parabens or tartrazine (FD&C Yellow No. 5).